Property 2: Apartment with spacious balcony in a beautiful mountain location, recovery all year! Property 32: The city apartment with feel-good character. Close to the center and yet in the countryside. 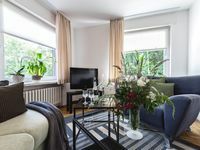 Property 49: Modern, cozy, bright apartments with swimming pool, sauna, WiFi up to 5 P - Wohnung "Kleine Hexe"
Homely apartment with all facilities you need available. Warm welcome from the host. In a nice area close to city center as well as close to nature.